If you’ve ever been to San Francisco and are observant enough (or have walked down the right alleyways), you’ve likely seen these small orange fishes everywhere. According to Japanese legend, there was once a particularly determinded Koi fish. Despite the warnings of all the other koi fish in his pond, this heedless little fish wanted to swim to the top of a gigantic waterfall. He knew it was nearly impossible, but he wanted to do it regardless. So the fish went upstream on his own. After a long and arduous journey, he reached the base of the waterfall. Summoning all his strength, the mightly little fish climbed to the top of the rushing falls. The gods, being impressed with his perseverance, decided to reward him. They turned the fish into a splendid and powerful dragon. 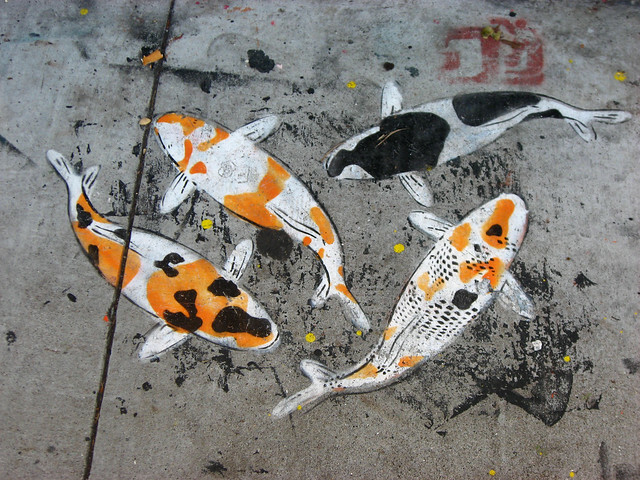 Seeing these koi painted all around San Francisco, reminds me that this city is our pond— chock full of artists, entrepreneurs, code artists, pixel dreamers all swimming around. So, koi of San Francisco, let’s become dragons.